Vasopressin (AVP), the antidiuretic hormone, is a cyclic nonpeptide that is involved in the regulation of body fluid osmolality. AVP mediates its effects through a family of G-protein coupled receptors, the vasopressin receptors type V1a, V2 and V3 (also designated V1b). The AVP receptor V1a is responsible for several functions, including blood vessel constriction, liver glycogenolysis and platelet adhesion. It is detected as a full length protein and a shorter protein, which results from proteolytic cleavage of its amino terminus. The V1a receptor is coupled to Gq/11 protein, which increases the intracellular calcium concentration. 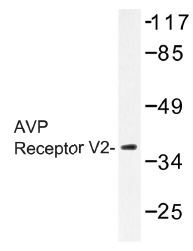 The human AVP receptor V2 gene maps to chromosome Xq28 and is expressed in lung and kidney. Mutations in the V2 receptor result in nephrogenic diabetes insipidus (NDI), a rare X-linked disorder characterized by the inability of the kidney to concentrate urine in response to AVP. The AVP Receptor V2 activates the Gs protein and the cyclic AMP second messenger system. 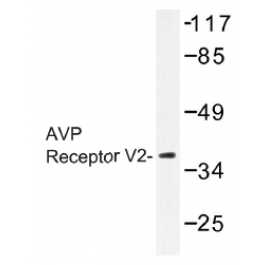 The AVP Receptor V3 is preferentially expressed in the pituitary and stimulates the release of adrenocorticotropic hormone (ACTH) in response to AVP by mobilizing intracellular calcium stores. AVP receptor antagonists may have potential therapeutic effects in hypertension, congestive heart failure, nephrotic syndrome and ACTH-secreting tumors. Phosphate Buffered Saline (PBS), pH~7.2 with 0.05% Sodium Azide as preservative. Liquid purified Ig fraction (> 95% by SDS-PAGE).